Kaiser Souzai, the duo behind the label BALLROOM Records is going to throw a huge party this weekend! “Representing the sound of the Berlin underground in it’s purest form, Ballroom has become a force to be reckoned with in the last year, the next few months set to propel the collective even further into the consciousness of techno enthusiasts worldwide. A brand synonymous with exemplary techno cuts, taste-making rosters and raucous events that solidify the meaning of the words raw and juicy, German production duo Kaiser Souzai present their magical Ballroom. 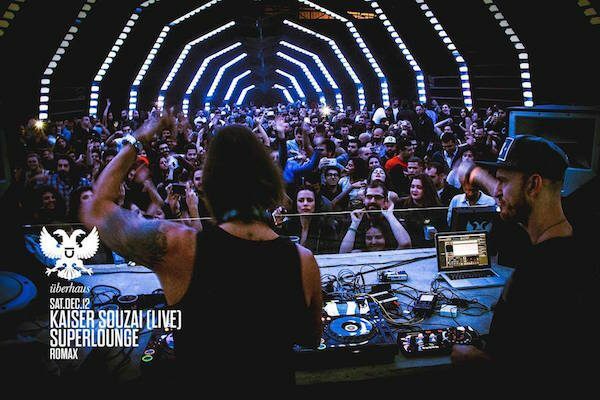 Originating from the dark streets of the Berlin underground, Kaiser Souzai’s Ballroom has grown from strength to strength – emerging as a bookings agency, expanding into a record label and now, more than anything, placing itself among the ranks of in demand global events taking over the world. The last year has seen Ballroom nights light up the international techno scene from Belgium to Australia, Thailand to Berlin, and not only with respected artists from the Ballroom roster (Josh Vox, Vom Feisten, Ale Castro & Dani Sbert to name a few) but with headline acts in the form of Super Flu, Jon Rundell and the legendary Booka Shade. Never sacrificing on quality, Ballroom cements it’s name as a brand that continuously delivers in killer techno, unique in the way they select their roster and unique in user experience. They go the extra mile for their ravers, with only the best in venue, DJ selection and atmosphere, their mission statement to party like it’s the last night on Earth. Ballroom has and will continue to shoot head first into 2016 with delicious line-ups both in their home town and across the seas, spreading the fire of impeccable techno and demanding an audience which in return, will receive a night they’ll never forget. stylistberlin is giving away guestlist spots! !